How to Make a Homemade Dog Shampoo Bar Soap - Oh, The Things We'll Make! 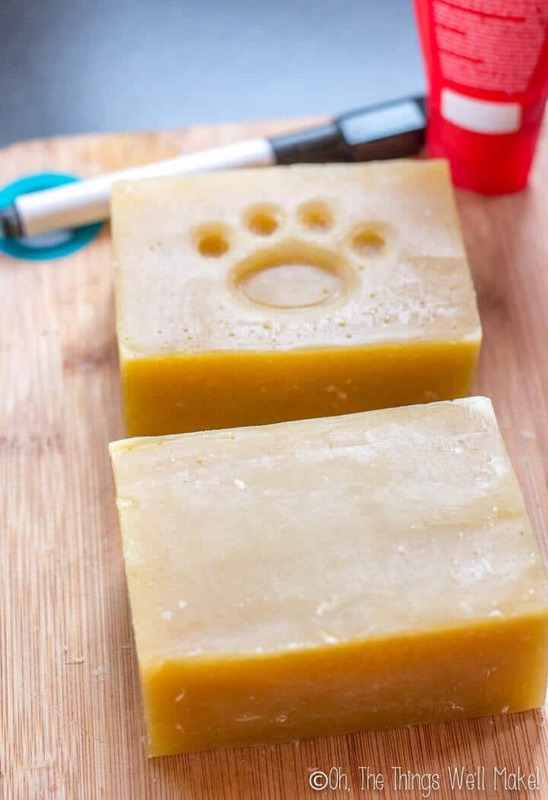 Get your dog clean the easy way with this dog soap recipe. I'll show you how to make a homemade dog shampoo soap bar, and how we use it to clean our pup. Several years ago, I started formulating a soap for bathing our dog. Despite my love of making my own bar and liquid soaps for general cleaning and bathing, I don't use soap for my hair. 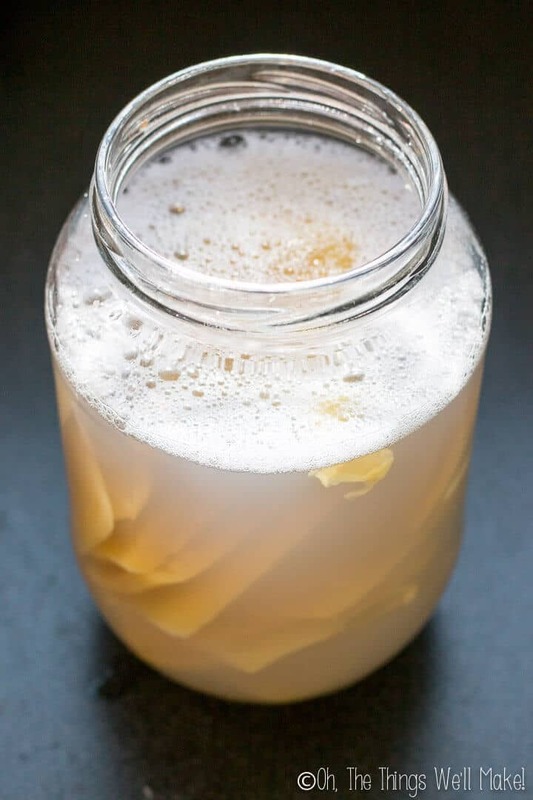 In fact, I've been working on making a general, non-soap shampoo, and I'll share my recipe for that soon. On the other hand, I do love using a bar soap to bathe our dog! Watch how to make the homemade dog shampoo bar and how I bathe my dog with it! Before I share my recipe for making a homemade dog shampoo (soap) bar, I'd like to share some of my reasonings, and talk about some of the myths or general beliefs people have about shampoos and soaps for both people and dogs. Is the pH of soap good for hair? Soap is always on the alkaline side, with a pH above 7. In fact, more often than not, the pH of soap is above 9. While I have already talked about how soap's high pH doesn't generally concern me when using soap for bathing, I don't like the idea of using soap on my hair! I have always read that our hair doesn't react well to having an alkaline cleanser, leaving the cuticles of the hair standing and leaving hair dull looking. It can also contribute to mechanical friction between hairs leading to damage. I was even more inclined to believe what I've read after trying out various “no poo” methods of cleaning my hair. I tried everything from vinegar rinses to rinsing my hair with a mixture of water and sodium bicarbonate (aka. baking soda). Vinegar left my hair shiny, but feeling greasy and gross, and things didn't get better with time. Baking soda, on the other hand, left my hair feeling ever worse. I ended up with hair that felt like straw and looked dull and brittle! 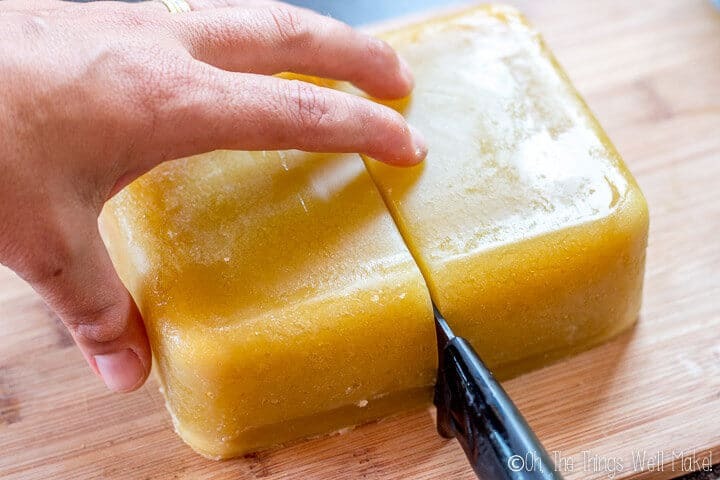 When fabricating “shampoo” soap bars, the soaps are normally highly superfatted to help combat some of the shortcomings of soap for hair, and help prevent some of the damage that it can cause. Even when made in that manner, I don't think soap is ideal for making shampoo. If I feel that soap can be damaging to hair, why would I use it on my dog's hair? A dog's skin is more alkaline than human skin. Their skin is said to have a pH above 7, on the alkaline side, whereas ours has a pH on the acidic side (in the 5.5 range). It is normally said that human shampoos have a lower pH than those formulated for dogs, which should fall in a more neutral range. In fact, that's one of the main reasons that people are often told not to use their own shampoos on their dogs. In practice, though, I don't think that's necessarily the case. It's a bit of a myth that dog shampoos have a higher pH than those made for humans, and it is really more dependent upon the shampoo itself. (The last link will bring you to a study conducted by Barbara Bird, CMG, in which the pH of 60 pet shampoos were compared with 45 human shampoos. She showed a huge, overlapping range of pH value for both types of shampoos.) For a more complete version of the article, where you can see a list of the different shampoos studied, check page 12 of this PDF where the study of the pH of pet and human shampoos begins. 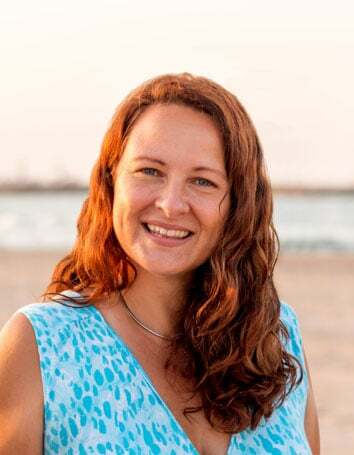 She believed that the main reason for choosing a shampoo made for dogs rather than one for humans is that human shampoos are formulated for using several times a week or even daily. 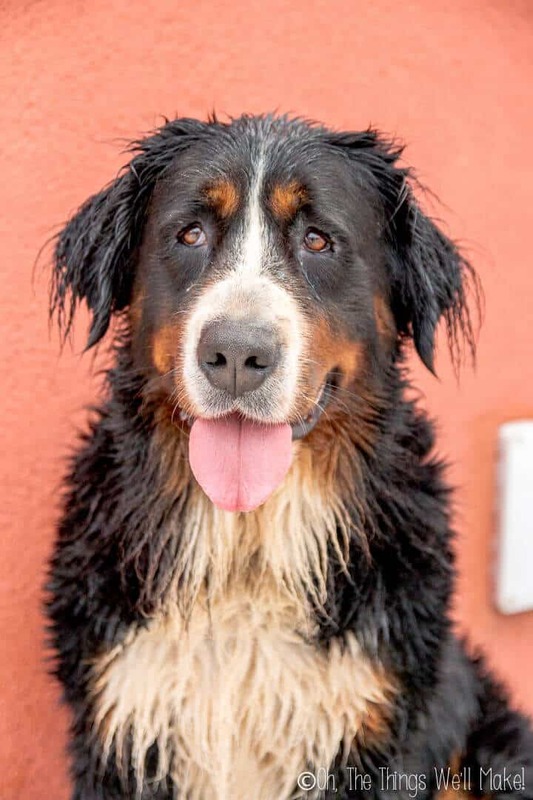 Dogs, on the other hand, are normally bathed much less often, and are probably much dirtier at the time they are bathed and will require a more cleansing shampoo. In the end, after all of my research, I couldn't find any reason NOT to formulate a dog soap bar, so I decided to make one. (Simple as that!) You don't want to use this or any shampoo very often on dogs because it will dry out their skin. Period. Plus, since then, when my dog has had bouts of eczema “hot spots” on her skin, her vet has told me that the best thing to do in those areas is to clean those areas with a bar (lye processed) soap several times a day until the problem areas dry up. 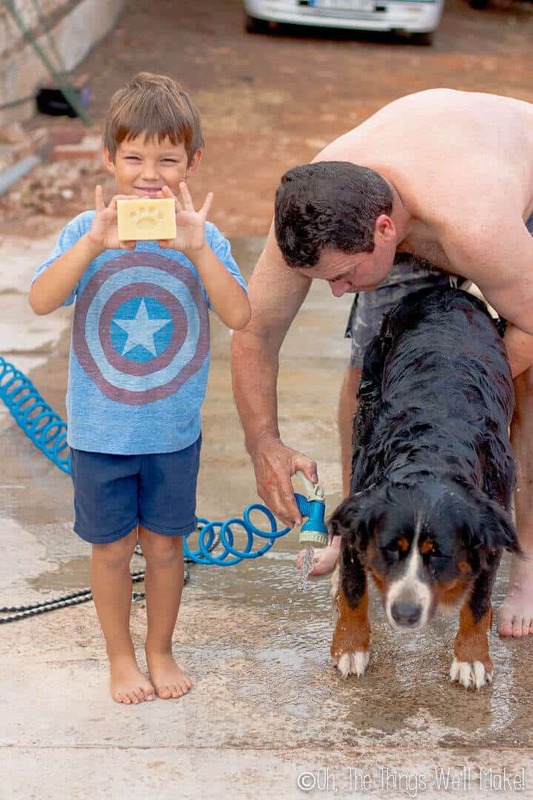 He didn't seem concerned about using regular soap on a dog. All of that said, I must reiterate that you should only be using this, just like with dog shampoos, occasionally. You shouldn't normally bathe a dog more than once a month, at the very most! We usually bathe our dog less often than that. If a dog needs to be cleaned more often than that, because of something particular that happened one day, I'd recommend a good thorough rinsing, or a rinse with some conditioner instead, if you can get away with that. I choose to only wash with soap or shampoo more often as a last resort (or in localized areas where I'm actually trying to dry out problem areas of skin as prescribed by the vet). In the end, I tried making my first dog soap mostly as an experiment, knowing that many people swear by using soaps on their dogs. I, too, was pleasantly surprised by how much I loved it! Being used to using liquid shampoos, I was sure that I would prefer a liquid soap for washing my dog. One of the things I tried was dissolving the pieces that I had cut off the soap to square it up into some water, and I started out by using that. The problem? It took a heck of a lot of dissolved soap to get any lather. I was using a lot of soap and it still didn't feel like I was getting my dog very clean. It wasn't a commentary on the quality of the soap. I've always had a similar feeling when using dog shampoos on my dog. I end up using quite a large portion of the bottle to cover all of the fur, and it's hard to control where it all goes. If it's liquidy, it runs all over the place and a lot is lost. If it's thick, it's hard to spread all over the body. Using a bar soap is a whole other game. I purposefully made large bars of soap so that I could easily grip onto them when I wash my dog. We start out by wetting down all of her fur before proceeding to rub the bars of soap all over her coat. I was surprised by how quickly everything lathers up, and by how easy it is to cover her entire coat with soap quickly. With a bottle of shampoo, I'm constantly trying to hold my dog in place, while trying to pour the shampoo either into my other hand or directly onto her fur. Then, trying to spread it all around is just as tricky. Using a bar of soap is so much easier to fully clean your dog! While I haven't noticed my dog's hair being dull after washing his hair with the soap, I like the idea of following up the soap with a bit of conditioner. Just like with dog shampoos, there are plenty of dog conditioners on the market. I studied the ingredients of a few of them, and I honestly didn't see much of a difference in the ingredients used. Once again, my intuition tells me that a lot of the difference is really just marketing hype. What I would say is that it's probably best to use a lightweight type conditioner on your dog, and one with mild ingredients, in case not all of the conditioner gets rinsed away. That's why I use the same lightweight DIY hair conditioner that I make for myself. It's light enough to use as a leave in conditioner, so if any is left behind, it isn't a problem. It uses mild ingredients, so there's nothing that will bother my dog's skin. In fact, I believe it's quite nourishing. The pH was around 6 last time I checked, so it is close enough to neutral to not bother a dog's skin, if pH is even an issue, but not alkaline, so it leaves the hair nice and shiny. I really love using the conditioner because it helps me get out matts and tangles in my dog's hair, all while leaving it feeling nice and soft. Are essential oils bad for dogs? Not all essential oils are safe for dogs, but I chose a mixture of insect repelling essential oils for this soap that are said to be safe for dogs. (As with essential oils for people, essential oils on dogs should be used diluted as it is in this soap.) I chose these particular oils to help leave behind a scent that will help keep some insects away. That's also one of the reasons I chose neem oil for this soap. If you don't have all of the oils I used on hand, you can leave some out and exchange them for a combination of some of the others. Or, if you prefer, you can just leave the essential oils out altogether. In any case, the neem oil also leaves behind a scent that will help ward of unwanted insects. Neem oil in soap is antibacterial, antifungal, and has insecticidal properties. It's an ideal ingredient for a soap for dogs because it can help clear up their skin conditions all while mildly keeping insects away. 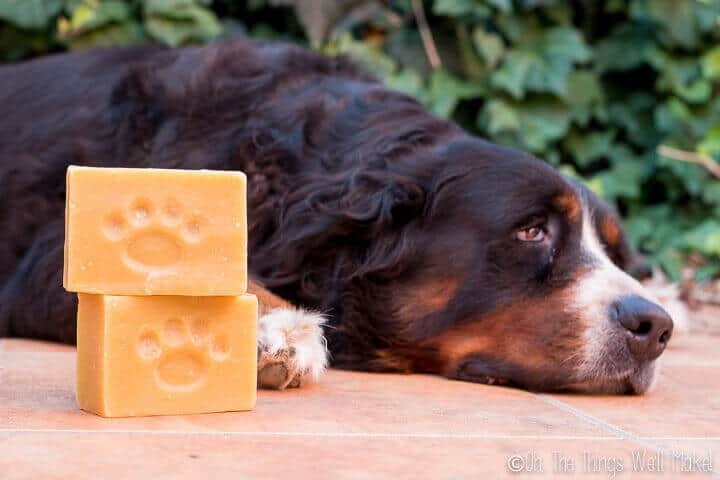 Get your dog clean the easy way with this dog soap recipe. 75 g rapeseed oil See notes below about possible substitutions. Put on safety goggles and gloves before working with lye. This is just a safety precaution because lye is caustic and can burn your skin. Weigh out the lye and water in glass, ceramic, or heavy plastic bowls. Mix together well the lye and water until the lye has fully dissolved. You will notice that it heats up and gets more opaque first and then it will cool down and get clearer. Leave the mixture to sit in an area where it won't be disturbed by anybody or any animals. Weigh out all of the main oils (olive oil, coconut oil, neem oil, rapeseed oil, and castor oil- not the essential oils) on a kitchen scale. I find it easier to tare a large bowl and then add each oil to it, taring again between additions. Add the lye solution to the oil solution and gently mix together. Continue mixing the ingredients with an immersion blender until you reach trace. Trace is the point of making soap when the saponification process has begun. It is when the mixture gets more opaque and thicker, looking like an emulsified sauce. At trace, you can now add essential oils. You can either weight them out and add them, or add some and take a whiff to see how strong the fragrance is. Fully incorporate the essential oils into the soap mixture. Cover and insulate the soap with a towel, and set it aside where it can stay undisturbed for a day or two to harden up. Check on the soap occasionally, and unfold it when it appears hard enough to easily unfold without breaking. Cut the soap into bars. For this particular use, I like to make big, chunky bars of soap that are easy to hold onto when washing our dog. They've worked really well for us so far! I stamped a paw pattern into my soap, while it was still somewhat soft, using the plastic caps of items I found around the house. You can decorate your soap with soap stamps or rubber stamps or something else like I did at this point. Set the soap aside for a few weeks to dry and harden up more. While the saponification process will have completed within a couple of days and you can technically use it then, the soap will harden and improve with drying time, meaning it will also last you longer when using it. This soap uses a superfat percentage between 5% and 6%. Can I substitute the rapeseed oil for another oil? I used rapeseed oil because I was trying to use up some leftover rapeseed oil that I had bought when I wanted to make a copycat activated charcoal face bar of soap. A lot of people are unfamiliar with the oil, though, and don't want to buy it for only a recipe like this one. That's why I'm offering substitutions. If you substitute the rapeseed oil for sweet almond oil, the superfat amount will also be between 6% and 7%. In either of these cases the soap should end up being very similar to the original posted recipe. Brush your dog to allow for easier wetting of all of his or her fur. Fully wet your dog's fur with water. 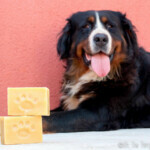 Use the bar of soap to work up a lather all over your dog's fur. You can optionally comb through the fur again to make sure all areas are well covered with soap. Rinse all of the soap from your dog's fur. Now you can use some conditioner to help make brushing easier and help remove any tangles. It will also leave your dog's fur soft and shiny. Comb through the fur with the conditioner in place. Let your dog shake off the extra water. You can once again comb through the fur as it dries to help remove any loose fur and have your dog looking his or her best. Enjoy your nice, clean, soft dog! Thank you for the recipe, I want to know if this recipe si Also for hourses or other animals? Do you have any tips on modifying this recipe for hot process? I’m interested to know if saving the neem oil to add at the end (so it acts as the main superfat) would salvage more of the anti bug properties of the ingredient. I have had some trouble with essential oils disappearing in hot process even though it’s supposed to be gentler on them, even when I add them at the very last moment when it’s cooled as much as possible. Peppermint and eucalyptus always shine through but lavander is just gone lol! Also, great job on researching the scents that are safe for dogs and repel bugs. I’d only add that I read that wintergreen mint is poisonous for them while peppermint is totally fine (I doubt most people would accidentally substitute one for the other but it’s good to know). Anyway thanks for the amazing recipe and research I can’t wait to make my own puppy soap. I rarely hot process, unless it’s a soap that really needs it for one reason or another? Is there a reason that you would prefer to hot process this one? As for the neem and superfatting, it’s really hard to know. There is so much debate about if adding one soap last will help it be the superfatting oil or not. It makes sense, but some people say that it doesn’t necessarily work. Just wondering how many bars this recipe makes of normal sized bar of soap? This soap is a bot smaller batch than what I normally post/make, but I purposely did that because I figure you won’t be using this as often as you would a normal soap. I ended up making 2 large bars of soap. I liked making large bars that were block shaped because I find it easier to clean my (large) dog with that. Also, when you finish cleaning your dog, you’ll probably want to rinse the hair off the soap. I didn’t want the bars to get used up too quickly. It would probably make around 4 more normal-sized bars of soap. Love reading your blog. I am a soapmaker. I do make dog soap. Your formulation is great. But I do want to question the percentage of your essential oil blend. My safety assesor recommends to only use 0.25% of essential oil blend on dog soap, for safety purposes as they lick their skin/hair. The blend you have has 3% which is the maximum for human. Dog soap needs to be treated like baby soap in terms of essential oils. Just to say, that is the safe margin for animals. I would love to know where you assessor came up with that concentration. I studied it quite a bit before posting, and most places recommended a dilution of .5-1% for a leave-on product for dogs. Because this is a wash-off product, the concentration could be raised much higher, especially when followed up with the conditioner I mentioned. The conditioner uses a cationic surfactant as the emulsifier, so even more of the EO’s end up being washed away. I would like to clarify that I’m not disagreeing with you, but rather am trying to get to the real truth when it comes to what is really safe for animals. In all honesty, my dog doesn’t really give off much, if any, of the essential oil scent, once washed with this soap. I personally believe that adding .25% in a wash off product like soap would be completely useless and a waste of time and materials, so if that’s the real safe limit for a wash off product, I’d actually probably just advise to not use any at all. Have you consider the PH for the dogs? How does the dogs react to it after washing? Any improvement on the hair and skin? Yes, if you read the article, you’ll see I covered the pH issue. Dogs have more alkaline skin than we do and can better handle the alkaline pH of soaps better than we can. Interestingly enough, whenever my dog has had skin reactions (hot spots) due to licking, scratching, etc., my vet has suggested using soap on them to help heal them more quickly. In any case, we don’t wash our dog often. Dogs don’t need to be bathed often. When we wash her with this soap and follow up with my homemade conditioner, her hair looks beautiful afterward and is very easy to comb. I’m going to make some of these shampoo bars but it was brought to my attention by my nay-saying brother-in-law that a bar of shampoo would get disgusting and covered in hair. Have you found this to be an issue? I still find it easier to use than shampoo. My dog hates taking baths and tries to run away the whole time, so it’s almost impossible to hold her, open the shampoo bottle, etc. With the bar of soap, you are using one hand to hold her while using one to soap her up. No need to put it down to apply- and then search for it again to get more shampoo. You know? Nice! Thanks for your reply! I think I’m going to try to make some today. You’re welcome! I hope it goes well for you. I really was surprised how much I like using soap for bathing our dog. hello, ¿what is pH of this soap? Sorry for the delay! I had to find time to go test it out. I dissolved a bit of the soap with distilled water and get a reading of around 8 using a test strip. It may be slightly higher than that (based on my general experience with soaps), but it definitely resembles the color for a pH of 8 and not the one for 9. 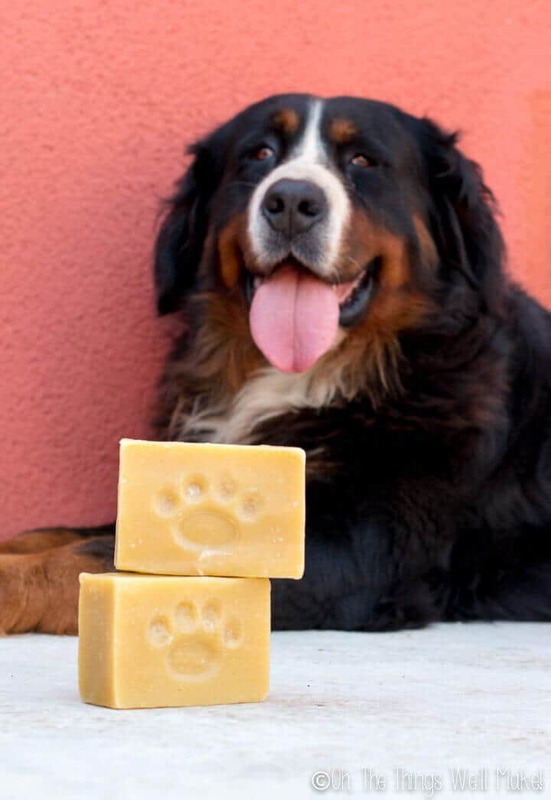 My bar of soap was made a long time ago (I’m still using the same ones that I made when I first wrote this post as we don’t bathe our dog often), and that may also influence the pH. Recently I have read that in cold process, neem oil loses its medicinal properties. What’s your opinion about this? Well, that’s an interesting question. I think that the oils get completely changed when they are used in soap so it’s almost impossible to predict what you’ll end up with in the final product. I think that’s especially true of liquid soaps. I tried making a copycat recipe of Dr. Bronner’s Castile soap and found that when I used higher percentages of more expensive soaps like jojoba and hemp oil that I didn’t really end up with a better soap. In fact, it was less aesthetically pleasing. In this case, I’m mostly using the neem soap for its scent, and that does remain. I think that the neem oil probably does slightly help against insects. That said, soap is a rinse off product, so any additives you put in it can only go so far anyway if that makes sense. I had seen that the right way would be to put the neem oil at the final stage of Hot Process method. But for me, HP it’s more complicated. So, does your CP recipe works well against flea? i can’t find neem oil… can i replace it for hemp oil, for example? or had more coconut instead? In lotion recipes, you can normally switch out oils pretty easily, but in soap recipes you have to be careful about switching them. Each oil has a different value as to how it will react with the lye- so you’ll need more of certain oils than others. If you make dramatic switches, you could end up with either too much or too little lye- meaning that you’ll end up with either a harsh soap or a soap that is soft and takes longer to harden up and cure. In this case, neem oil is used at such a small part of the recipe that the switch probably wouldn’t be enough to make much of a difference, but it’s always best to run the new formula through a lye calculator to be sure that you don’t need to adjust the lye amount by much. Hemp oil looks like it has a similar saponification value, so you’d probably be fine with that switch. Yes, there are parts of the avocado that can be problematic for many animals. There is a debate about whether or not avocados are bad for dogs, but the places I’ve read have said that avocado oil is safe for dogs. That said, making soap with avocado oil isn’t the same as feeding it to your dog. First, because it undergoes a chemical reaction with the lye, and you are no longer really left with lye nor avocado oil. Second, the dogs aren’t ingesting it. You are only using the soap to cleanse their fur. I hope that helps clear things up! This looks great! That essential oil blend looks amazing! Thanks so much. Yes, It’s still working quite well for us. We’re planning on giving our dog another bath this weekend with this soap as she’s headed for surgery this week and we wanted her to be nice and clean in preparation for it. I was really surprised by how much I like this soap for her, especially as soap doesn’t work very well on my own hair. I Mai made your soap, and it works beautifully. Thank you for the article. I have been experimenting with a dog soap of primarily coconut oil (5% superfatted) with 20% neem oil. Do you think almost 100% coconut oil superfatted with some (15 or 20%) neem oil is okay? I keep hearing soap made from 100% coconut oil will be too drying, but it seems at 5% superfatted along with some neem would be moisturizing enough. I plan on selling as a dog shampoo, and may even creating a liquid version. What are your thoughts on this recipe? I just don’t see a need for a soap with 5 and 6 different oils in it. I’d be more worried about a soap for a person who will be using the soap daily. Dogs (hopefully) won’t be bathed that often, so I really doubt that it should end up causing problems with such occasional use. I personally love adding in olive oil to soaps to bring the conditioning amount up. I ran the recipe of 80% coconut oil and 20% neem oil through soapcalc.net, and, as expected, it predicts a very hard, bubbly, cleansing soap that isn’t very conditioning. You could always bring the superfat content up a bit to compensate for that, but I’m not sure how much that would really help. I love using the homemade conditioner after bathing our dog with soap. I think that would definitely make up for any amount of drying that could be caused by the soap. Of course, not everyone will necessarily want to do that. I don’t know. I guess my answer is that I’d prefer to use a more conditioning soap, so I’d probably want to add some olive oil to it. You don’t need a soap with 5-6 different oils, but I do like the thought of a coconut/olive/neem oil combination. All of that said, because you shouldn’t be using soap (or shampoo, for that matter) very often on your dog, I don’t think it should really cause any big issues. My dog has oily hair by the time I bathe her, so the coconut oil probably is helping a lot with getting that clean. I still highly recommend using the conditioner afterwards. It’s basically a light lotion that helps soften the hair, making it much more manageable, but is also conditioning for the skin underneath! Thank you for your input. I will try a test with some olive oil mixed in as well. I have no idea what meow milk is! Ha! That said, you can definitely switch out some of the water for something like goats milk, if you like. The procedure is a little bit different as the sugar in the milk will react with the lye, so you need to make sure it’s either very cold and kept cool throughout the mixing process, or you can freeze the milk. To see the procedure better, check out my pumpkin spice soap recipe. I use goats milk in place of part of the water in that soap, and show how to do that. Hi there, thanks for the recipe! I lived in The Czech Republic where they had fields and fields of Rapeseed flowers. I was told this is the real name for Canola oil. They didn’t want to call it “Rapeseed Oil” lol. Please correct me if I’m wrong thanks again for sharing! !